The MX-4S is a voltage controlled stereo mixer with four independent inputs. 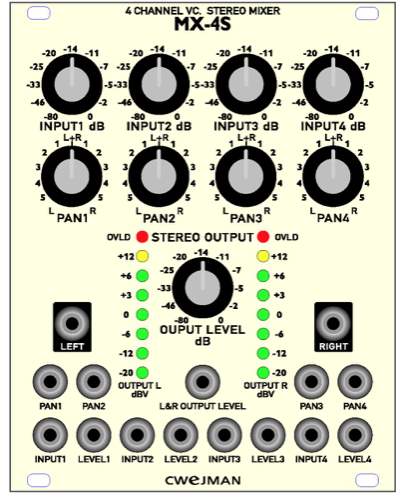 All parameters such as input gain, panning and output again ( both left and right channels output level are ganged) are controlled manually by knobs or associated CV inputs. The mixer accept both DC and audio signals so it can be used for audio signals and control signals. The LED bars displays the outgoing signals strength. The performances of the mixer such as low distortion and low noise, are superior thanks to ” the state of the art” voltage controlled devices. 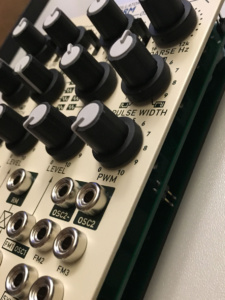 The DMF-2 is a dual mode and dual slope filter and emulates the familiar low pass filter in 4 pole mode and expands sonic potential by adding a unique designed 6 pole low pass mode and quasi and pass mode. 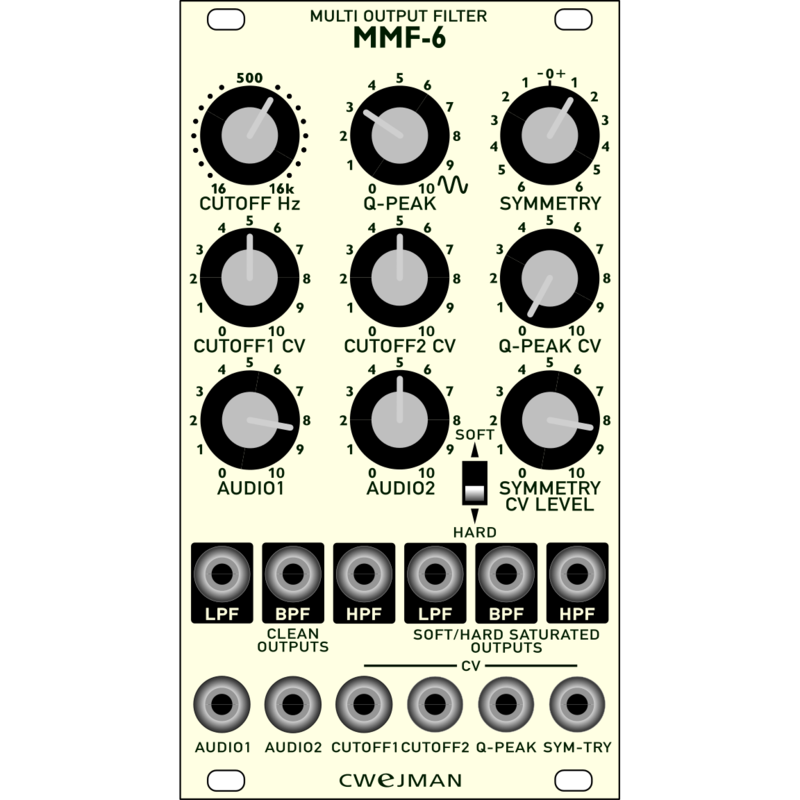 Both filters (A and B) are identical and can be controlled separately and by master inputs for the cutoff (CM A+B). 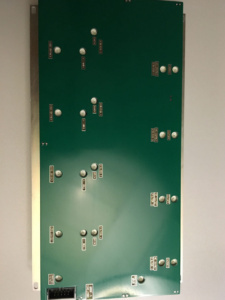 The audio outputs from both filters are combined (LPF A+B and BPF A+B) with dual resonance (peak and offers “formant” shaped sounds in low pass and band pass mode. 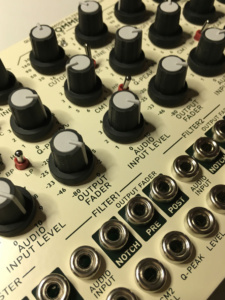 Filters has an individual audio inputs and additionally combined input (AUDIO A+B). 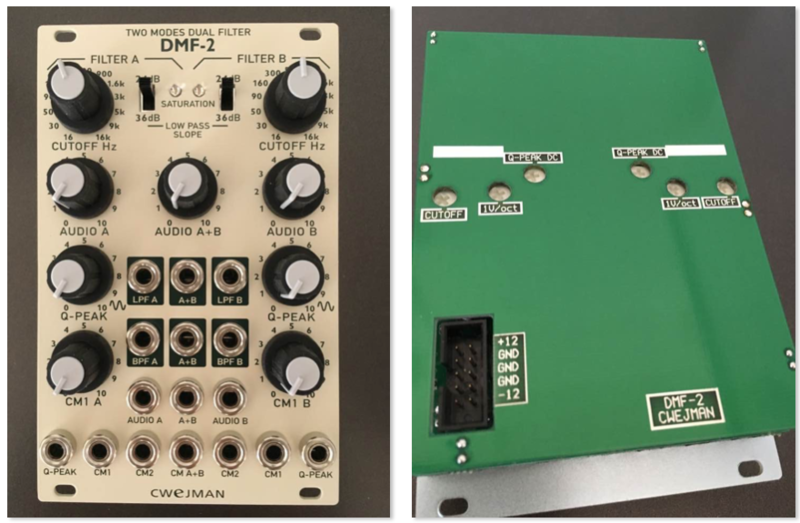 The DMF-2 is characterized by a non-linear transfer function, so-called saturation mode, that is affected by the level strength of the incoming signals. 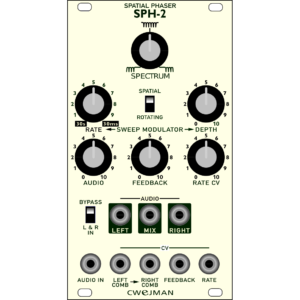 The SPH-1 is a 14-stage stereo image phaser. 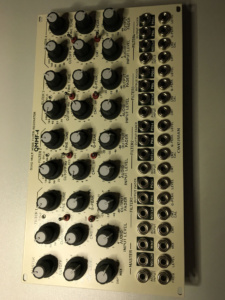 It consist of two identical voltage controlled all-pass filters with seven notches stretched over the whole audio range which ensures constant phasing effect. The all pass filters are combined with original audio signals resulting in an almost constant gain and phase shift of 2400 degrees across the entire audio range (see diagrams below). Additionally, the phasing effect remain almost constant even in saturation mode. Phasing (SPECTRUM) is controlled by modulating low frequency oscillator (MOD RATE, MOD LEVEL) and by external signals (SPECTRUM CV, and separate SPECTRUM LEFT, RIGHT). 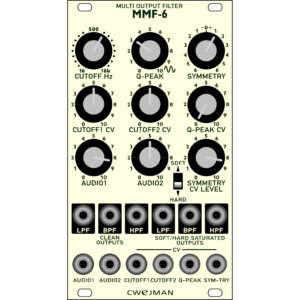 The low frequency oscillator’s rate can be modulated by external signal (RATE CV, RATE CV INPUT). 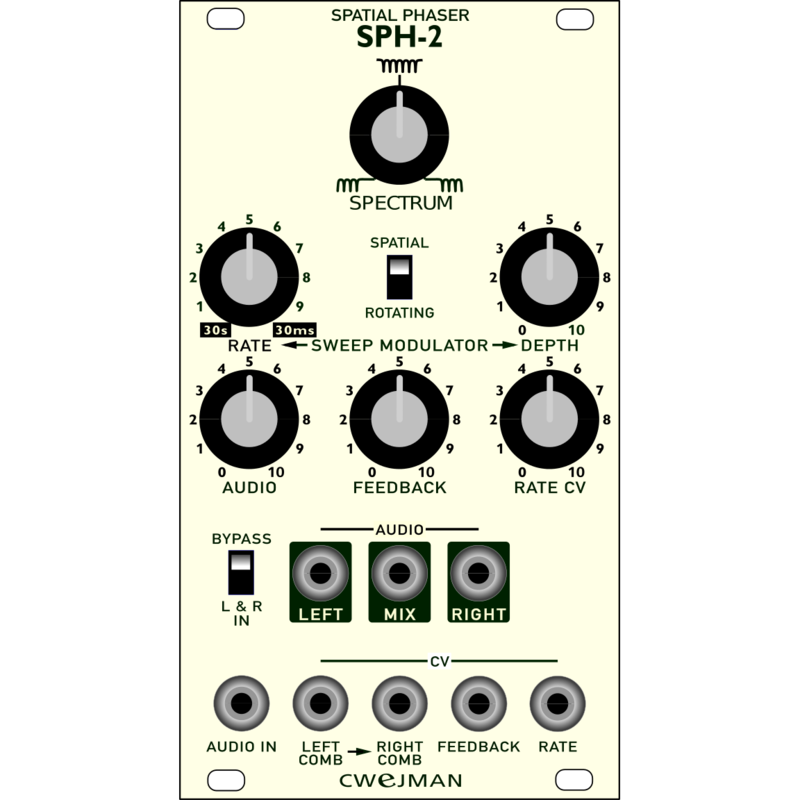 The SPH-2 provides one audio input for both phasers labelled by SUM AUDIO. The audio outputs are provided by output socket labelled AUDIO, LEFT, MIX (mixed left and right phaser) and RIGHT. Outputs are revealed by white surrounds. 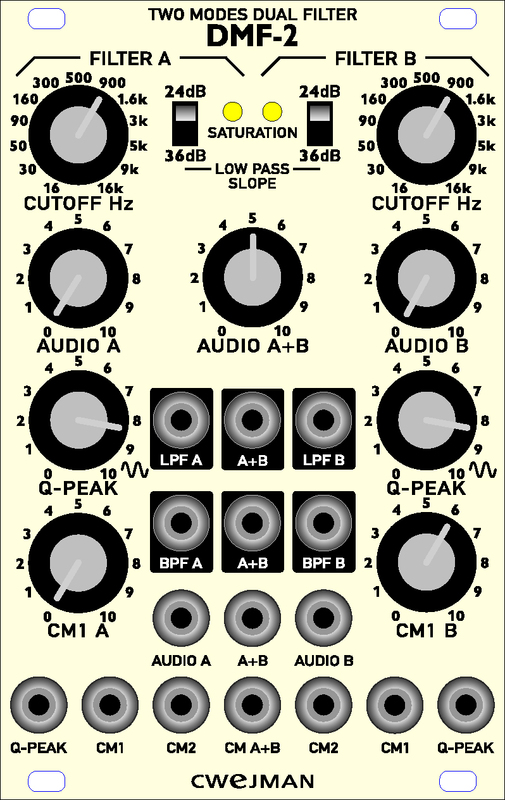 The FEEDBACK knob controls the amount of multi resonance for both phasers up to self-oscillating. The SPATIAL/ROTATING switch couples phaser between two different stereo images. The BYPASS/ L&R INPUT inserts both phasers in the audio chain in position L&R INPUT. The main purpose with the frequency shifter is to make frequency shift up and down for processed audio signal. Two signal sources are needed; the carrier and the audio. Both carrier and audio signals are splitted in two chains and are pre-processed to accomplish 90 degrees phase shift between splitted signals. COARSE, FINE and external CV signals (CARRIER CV). The carrier generators outputs are pure sine waveforms with 90 degrees delay between them. Outputs are patched to both ring modulators inputs. Two ring modulators (dual balanced multipliers) receives 0 and 90 degrees shifted carrier and audio signals . The outputs from the multipliers are combined in two ways; the frequency shift UP and DOWN. The frequency shifted audio signal is a sum (UP) or difference (DOWN) of the carrier generators frequency (a pure sine waveform) and all audio signals frequencies (fundamentals and harmonics). 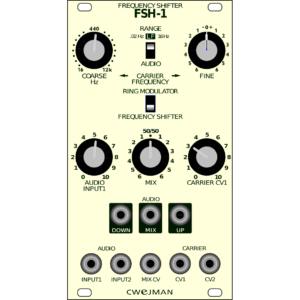 The FSH-1 works in two modes; as frequency shifter and as dual ring modulator. A ring modulator is a classic audio effect device and due to the non-harmonic character of the output signal. It’s very useful to create metallic timbres such as bells, sweeping whistles and percussive sounds and tremolo effects. The obvious effect (particularly in LF mode) is a stereo panning effect of audio signal. 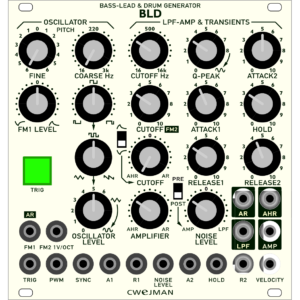 The BLD has all components and function necessary for generating bass lead and drum sounds with focus on bass drum sounds. 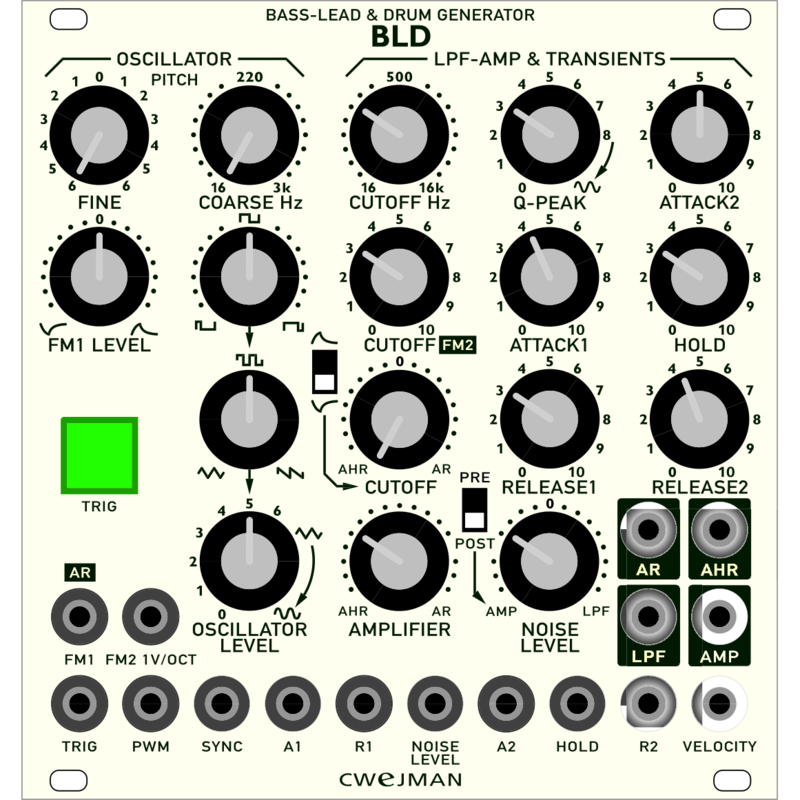 The BLD contain main sound generator (OSCILLATOR) and noise generator and modifiers such as low pass filter, amplifier and two transient (contour) generators. 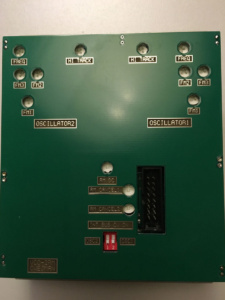 Oscillator has two manual pitch controllers (FINE, COARSE) and two inputs for controlling the pitch by external signals (FM1, levelled, bipolar pre-patched to transient generator AR and FM2, calibrated to 1 Volt/octave). Waveforms and mix between shapes is controlled manually from triangle, mix between triangle and pulse, pulse, mix between pulse and saw tooth and saw tooth). Oscillator level is controlled manually from 0 thru nominal signal strength to saturated (curved, for more punch). Pulse width is controlled manually and by an external signa (PWM). NOISE GENERATOR is connected to the low pass filter and to the amplifier (NOISE LEVEL). The noise generator can be routed in to the amplifier (PRE) or directly to the output AMP (POST). 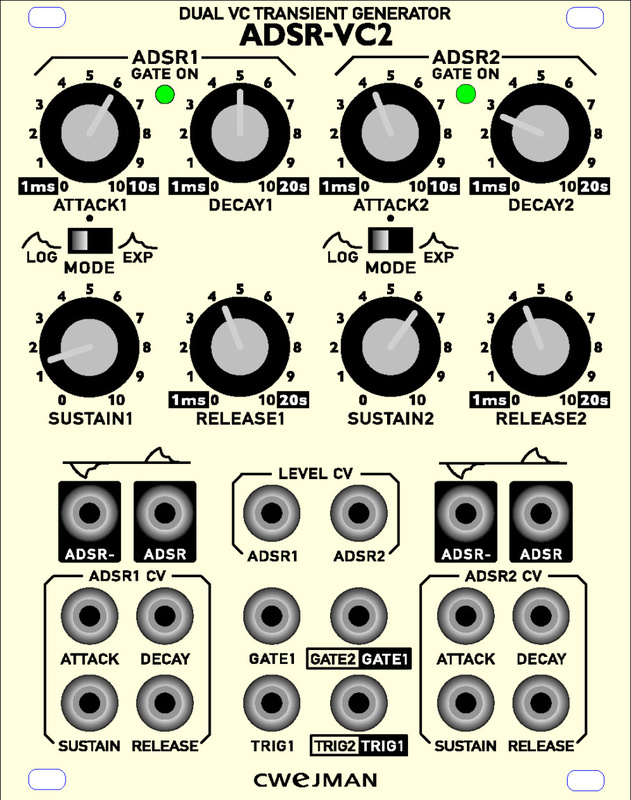 The noise generators level is also controlled by pre-patched AR generator thru input NOISE LEVEL. TRIG and/or by an external signal (input TRIG). Attack, Hold and Release are manually controlled and by an external signals connected to inputs A1, R1 (AR) and A1, HOLD and R2 (AHR). 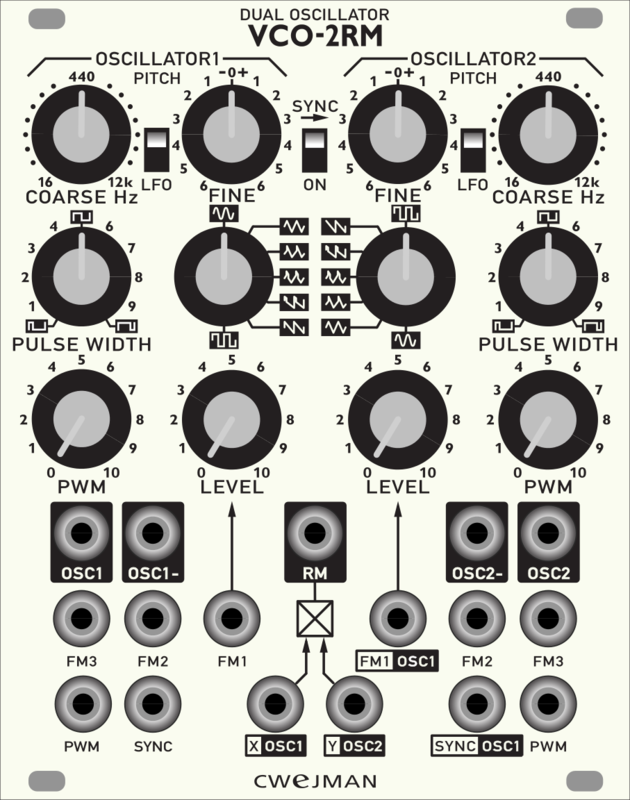 The oscillator’s frequency is controlled by COARSE,TUNE knobs and FM inputs. 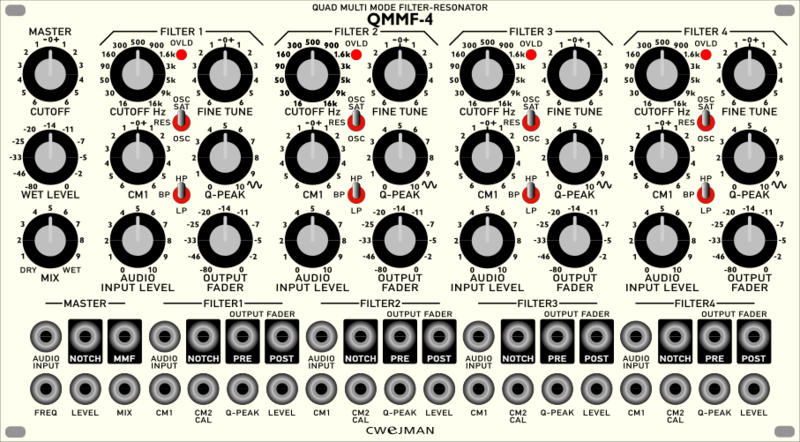 TUNE fine tunes the oscillators (± 6 semitones). 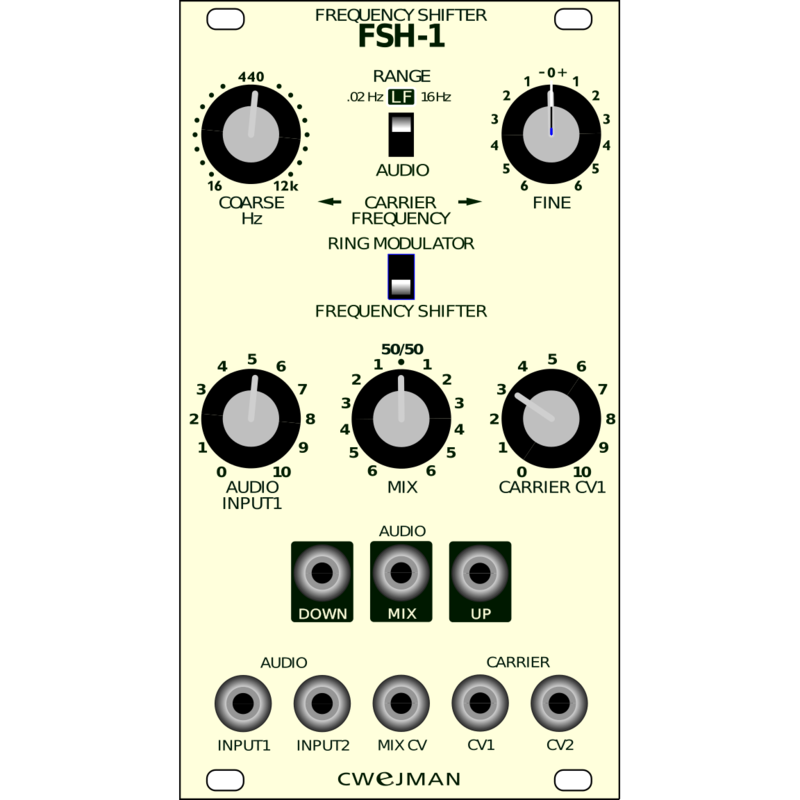 Frequency modulation (leveled FM1, FM2 and FM3 ) determinates the intensity of frequency modulation and/or pitch control. All FM inputs are carefully calibrated for 1Volt/octave sensitivity. Frequency modulation, by an audio signal, creates so called “side-bands” that consist of sum and difference of signals frequencies. These additional frequencies do mostly have a non harmonic sound. Modulation, by low periodic waveforms, such as LFO or envelope generator creates momentary pitch shift of modulated oscillator common named vibrato (by LFO) or pitch bend (by envelope generator). 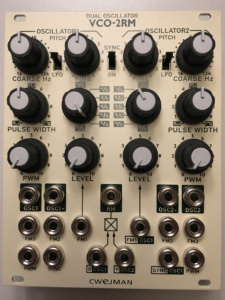 SYNC means that sync’ed oscillators frequency is tracked by the frequency of controlling oscillator; OSC2’s frequency is synchronized to OSC1’s frequency. When the tuned frequency of sync-ed oscillator has the same or multiple of frequency of controlling oscillator then sync-ed oscillators waveform has no or very little “glitch” which results in a sync-ed smooth waveform (sine waveform). The sync-ed waveforms (with additional FM modulation) are perfect for cutting edge lead sound and hard, funky basses. PULSE WIDTH % adjusts the pulse width of the pulse wave from 5% to 95%. WAVEFORM selects the waveform or a mix of waveforms from an oscillator. PULSE WIDTH control works also on the waveform mixes where the pulse wave is included. 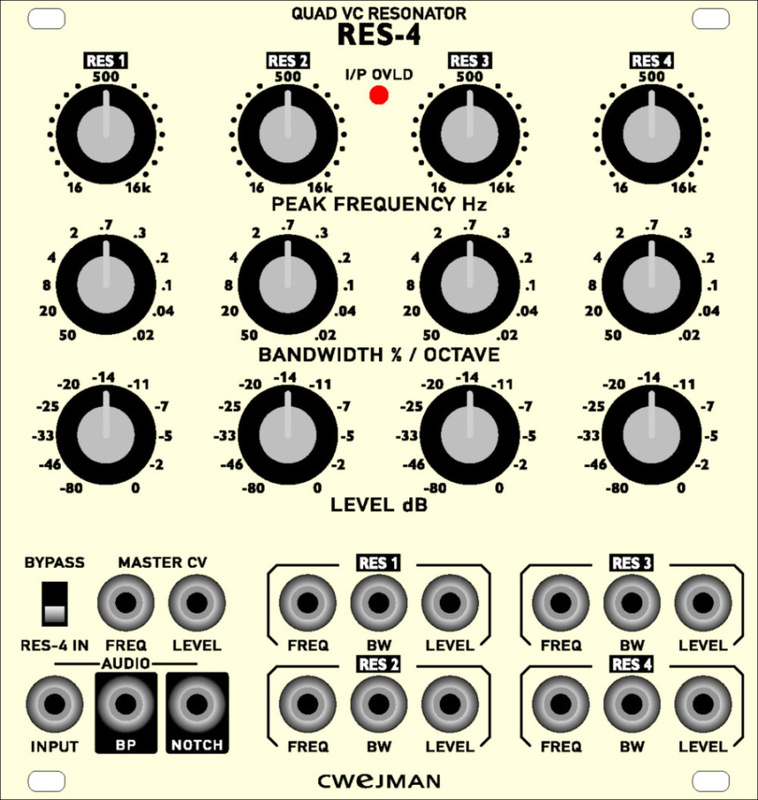 Ring modulator (RM) is a classic audio effect device and due to the non harmonic character of the output signal, very useful to create metallic timbres such as bells, sweeping whistles and percussive sounds and tremolo effects (modulated by low periodic signal like a LFO). 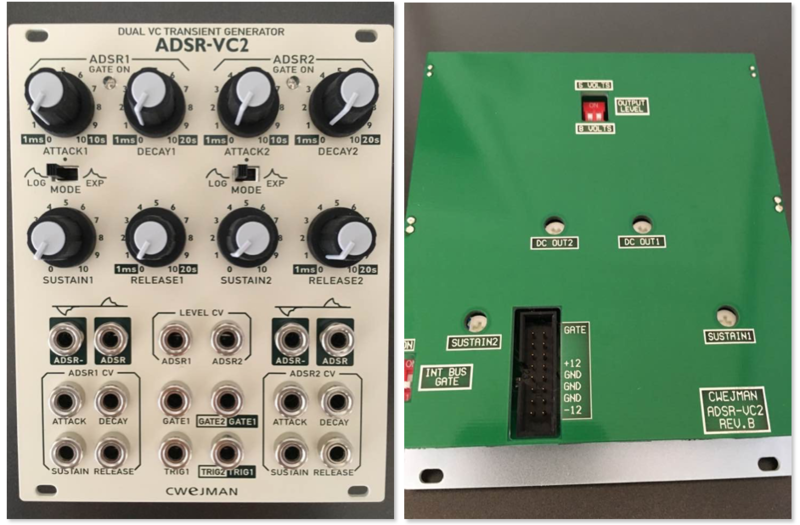 Two input signals are pre-patched to OSC 1 and OSC 2 outputs. Using the inputs X and Y, any other external signal can be routed directly into the ring modulator. As modulation source the ring modulator can produce a huge amount of complex waveforms both in the low and audio frequency range.